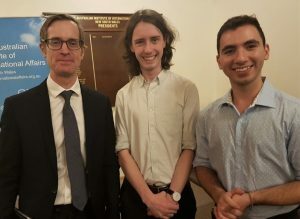 On Tuesday 16th April, Professor Theo Farrell, Executive Dean of Law, Humanities and the Arts at the University of Wollongong, addressed the Institute on the topic of whether peace is possible in Afghanistan. Prior to taking up his current position, Professor Farrell was the head of the Department of War Studies at Kings College London, which has close links with the UK Ministry of Defence. He was invited to do two reviews of International Security Assistance Force (ISAF) efforts in Afghanistan for the UK government and NATO. As part of that process he has interviewed Taliban officials on three occasions, so has a unique insight into how the Taliban view the conflict and what the prospects for peace are. Professor Farrell believes it is virtually impossible to defeat the Taliban outright. The Taliban are capable of sustaining enormous losses. They lost 20% of their fighting force during the years of the Obama troop surge but continue to regroup and keep fighting. After spending upwards of a trillion dollars on the war over more than decade, the US and its partners found in 2016 that up to a third of Afghanistan was under Taliban control or mixed Taliban-government control. The question for the Western and Afghan governments is when should they cut their losses? Professor Farrell argued that past peace negotiations have failed because the West has been working under the assumption that you need to inflict a catastrophic defeat on the Taliban. Military figures have not been open to pursuing long term peace negotiations. The process has also been hampered by poor diplomacy. For example, the Taliban were allowed to open an office in Doha in 2012, but it only stayed open for two days because the Afghan government protested against it presenting itself as a Taliban ‘embassy’. The whole fiasco was seen by the Taliban as a deliberate Western attempt to embarrass them. The Taliban have very complex politics. They have two wings – a diplomatic/political wing, who are politically-minded negotiators, and a fighting-force base, who take more hardline positions on issues like women’s education. It has always been difficult to keep in-group cohesion. Since the death of Mullar Omar, the Taliban’s original leader, was announced in 2015 the group has splintered. They lack the discipline and money they once had, and morale is low after costly campaigns and ongoing loss of life over the last few years. A key challenge for those engaging in negotiations with Taliban leaders is assessing whether they can bring the base along with them in negotiations. At the peak of their power, the Taliban could operate an effective shadow government, and were able to provide reasonable public services. However, that broke down whenever they were under sustained military pressure. Professor Farrell believes that the political-minded wing of the Taliban understand that Afghanistan has changed since they were last in power, and that they need to compromise to achieve power. Adding women to their negotiating team for upcoming negotiations is a recognition of this. Ultimately, Professor Farrell believes any post-war government will be a power-sharing arrangement. However, challenges for power-sharing exist on both government and Taliban sides. Afghanistan’s political institutions are weak. The current government is endemically corrupt and struggles to distribute patronage among its present coalition. Professor Farrell explained that the current equation for the government is how to make “1+1=1”, because you have two parties that want the available government patronage for themselves. When you add the Taliban into the equation it becomes a question of how can 2+1=1? On the more recent negotiations with the Taliban, Professor Farrell argued they have been remarkably successful. Trump seems determined to pull American troops out of Afghanistan – unlike Iran, it is not a major issue for this administration – and this will put pressure on the negotiations. Asked whether he could see a full troop withdrawal happening while the Afghan army are still so weak, he said that the withdrawal seems to be happening whether Afghans want it or not. The West has been working to build up the Afghan army for years, and there is a sense that if they are not ready now, they might never be ready. At some point America has to leave, the question is how to create the best form of power-sharing for Afghanistan.